I added a “memory game” to our site. This type of card game is sometimes called Concentration . Give it a try! Today I went for a nice hike; the weather was perfect for it. I passed a woman wearing a very interesting t-shirt: it had several stylized squids on it. I asked her where she got it, and she said online, at squidfire.com. So when I got home, I took a look at their site. They have a lot of squid-themed clothing, and some other fun items as well, so I’m adding them to our blogroll. I like the fact that many (perhaps all?) of their t-shirts are produced by American Apparel, which is a very labor-friendly company! I’m very tempted to get one of their tees for myself, but I’m having a hard time choosing which one. Our book is also available at the Ossining Public Library! Thanks to Ossining, too! The Squid Kids is now available at the Newton Public Library! I love the way they’ve got a little graphical image of the cover. They seem to have that for a lot of their books. Thanks, Newton! You’ve got a truly wonderful library, with so many great services and books. We’re very happy to be included! This post isn’t about squids, but it does have a marine theme. Last weekend, I went whale watching with a friend. We booked our trip through the New England Aquarium, and it was loads of fun. The ship took us from the wharf just outside of the Aquarium to Stellwagen Bank, a marine sanctuary east of Boston. We enjoyed the ride out, even though it was very foggy for most of the ride. 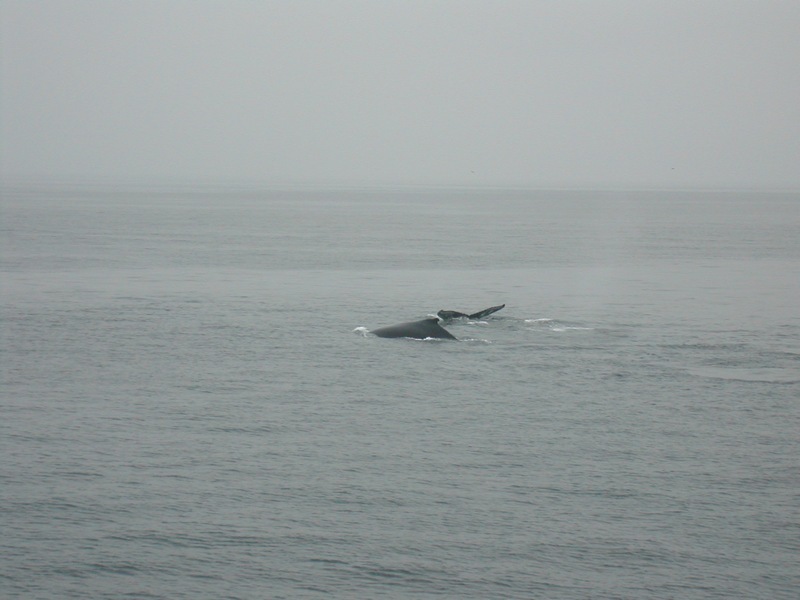 As we approached the Bank, the fog began to burn off, and we soon spotted other whale watching vessels, some observing whales in action. We didn’t race over to them right away; rather, we cruised along looking for activity elsewhere. It turns out that there are established rules regarding whale watching, and I got the favorable impression that our captain observed them strictly. Before I booked the tour, I did have some misgivings about it, since I’d heard that whale watching disturbs the whales. I specifically booked through the New England Aquarium because I figured they’d behave responsibly, and I was not disappointed. We soon found a few whales that were not circled by ships, and we moved over to their vicinity as unobtrusively as possible. In all, we saw three separate groups of humpback whales, some feeding, some with calves. There was a naturalist on board who described what we were seeing, and she did a great job! I’m really very happy with the experience (my poor photos do not do justice to all that we saw), and plan to do this again! My 5-year old granddaughter loves The Squid Kids. Suzie and Sammy’s adventures are lots of fun and very educational. Even very young children will love the beautiful illustrations. Syd is from Tifton, GA, the Reading Capital of the World. Thanks, Syd! We’re very happy to get such good feedback! Our 4 year old granddaughter came over to our home to play with her cousin the other day. She brought your book. Her mother said she loves it and takes it everywhere! Isn’t it great fun to know you bring such happiness to others? It certainly is a pleasure! Thank you for letting us know! I’ve added the Mississippi State University Squid Module to our blog roll. It’s got all kinds of interesting information about squid on it, including a lengthy exploration of a squid dissection. Which is kind of gory, if you’re friendly with any cephalopods. They’ve also got some fun instructions for building a bean bag squid toy. We got our author’s copy of the book! It looks great, and we’re very happy! We recently got an email from PublishAmerica that our book was sent to print, and can now be ordered at their online store. The book is scheduled to be available in early May! If you are interested in ordering, you can go to the PublishAmerica Online Store, and search for the title of the book, “The Squid Kids” (don’t use quotes in their search text box). You should see our book come up as a result. Right at this moment, their search function is not working, unfortunately. So if you have problems, please try again later… it will work eventually… I hope.